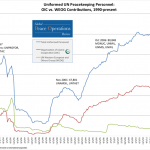 Welcome to the GPOR Featured Data page. 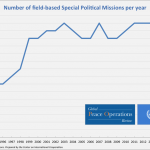 Here you’ll find links to visualizations of headline data and trends in global peace operations and the international system. 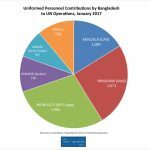 Topics covered include peace operation missions, contributions of uniformed personnel, gender statistics, and other aggregated data. 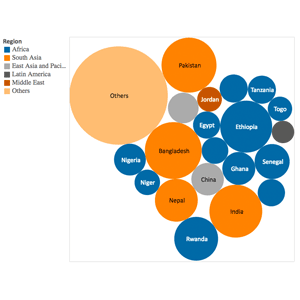 The visualizations are arranged by topic below. You can scroll down to browse and click on titles or thumbnails to view them full-size. 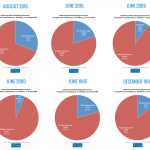 Please explore and share these visualizations freely. 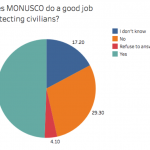 Does MONUSCO do a good job of protecting civilians? 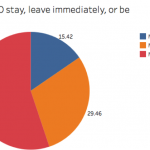 Should MONUSCO stay, leave, or be reduced in size? 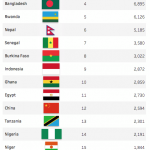 This dataset contains descriptive and demographic data on all current United Nations senior officials (USGs and ASGs), including the names of the current appointees in each position, their nationalities, gender, year of birth, and more. 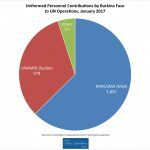 The Global Peace Operations Review has assembled and published this data for the first time in spreadsheet format to improve the accessibility and transparency of data regarding senior UN officials. 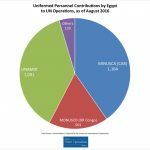 This dataset will be updated on a regular basis as new appointees are selected and confirmed by the UN. 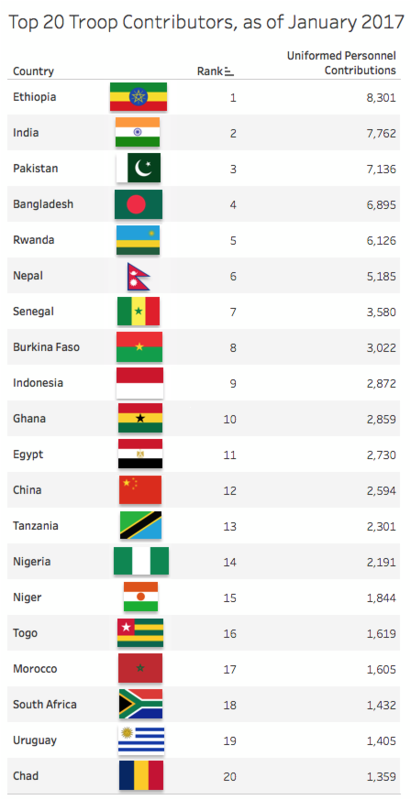 The infographics below show 2016 UN Senior Appointments by Gender and Nationality. 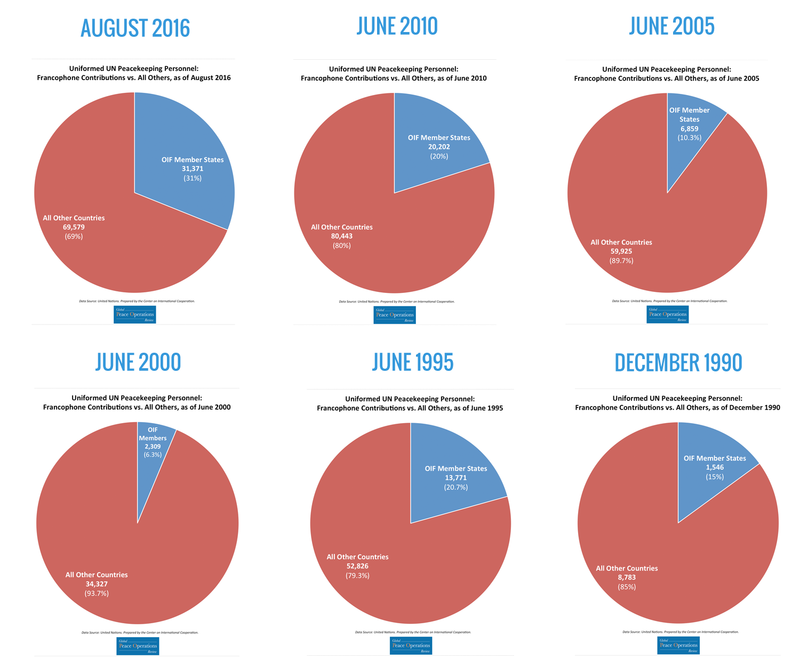 These visualizations are further research based on Karin Landgren's commentary The Lost Agenda: Gender Parity in Senior UN Appointments. 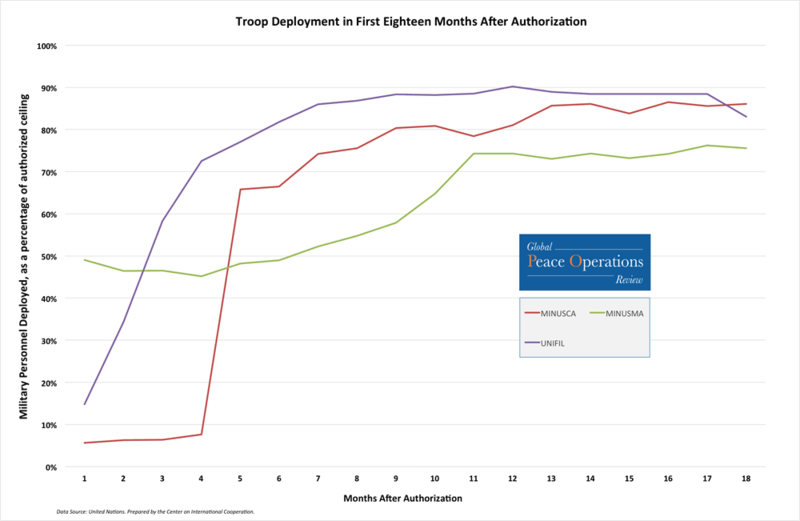 Click the below links for visualizations of headline data and trends in global peace operations. You can select global and mission specific data from the Data & Trends main menu. 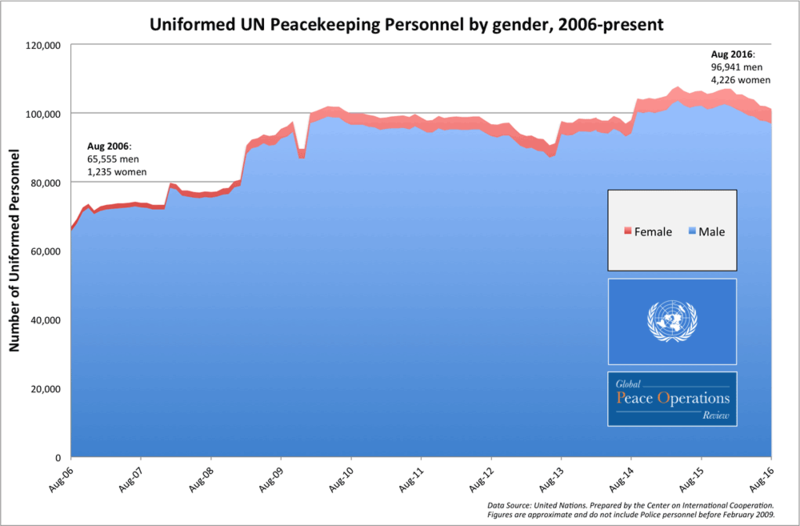 This area chart highlights the number of UN peacekeeping personnel, disaggregated by gender, from 2006-present. 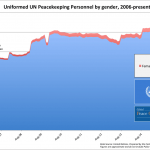 Every month since August 2006, over 95 percent of uniformed peacekeeping personnel have been men. 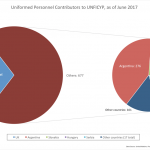 The pie chart on the left shows the number of uniformed personnel contributed to the United Nations Peacekeeping Force in Cyprus (UNFICYP) by the UK and by all other contributing countries, with the smaller pie on the right breaking down the five largest contributors after the UK. 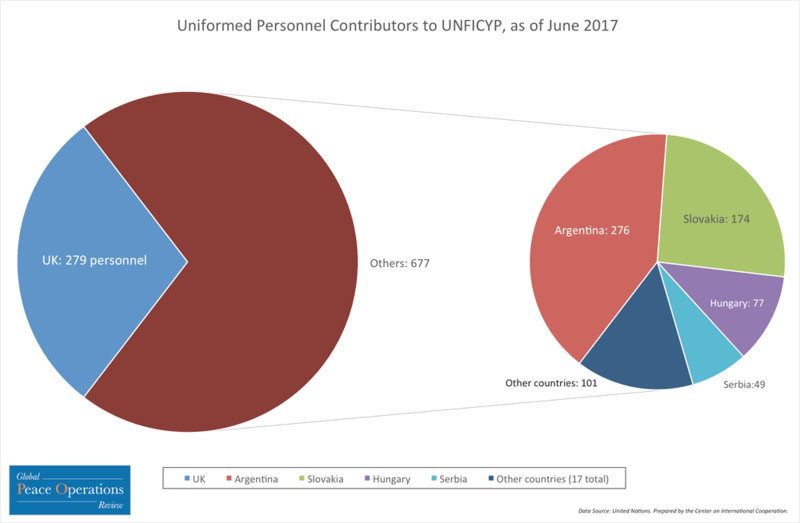 As of June 2017, the UK and Argentina contributed over half of all military personnel on UNFICYP, with 20 other countries also making contributions of various sizes. 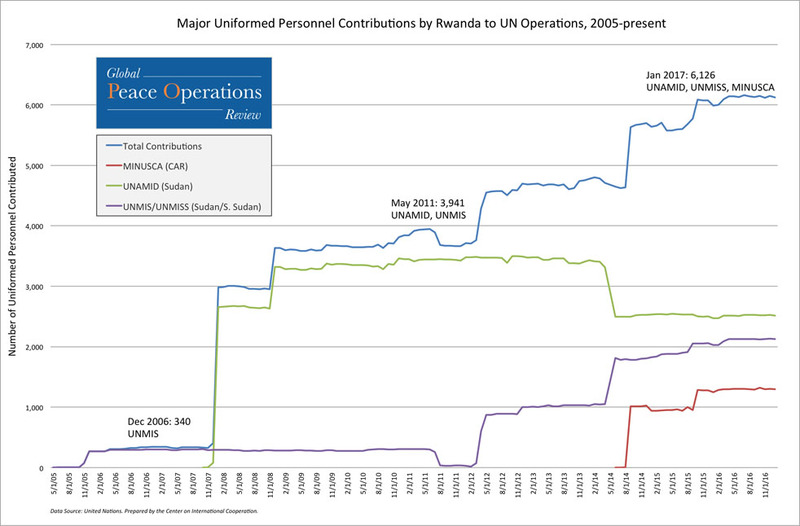 This chart shows the evolution of uniformed personnel deployed (red line) and UN authorized levels of uniformed personnel (blue line) on the African Union/UN Hybrid Operation in Darfur (UNAMID) from its inception (August 2007) to present. 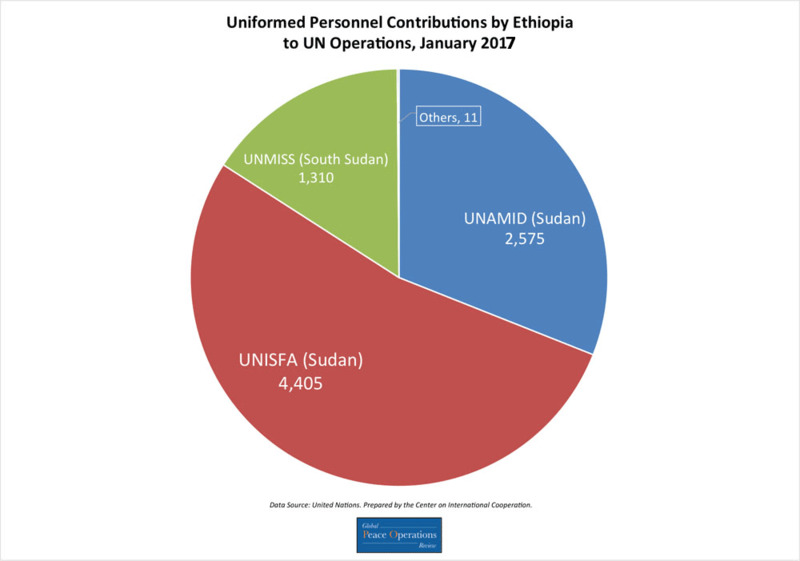 UNAMID is tasked with protection of civilians, contributing to security for humanitarian assistance, and monitoring and verifying implementation of peace agreements, among other duties. UNOCI has been operating in Côte d'Ivoire since March 2004, in response to the First Ivorian Civil War. 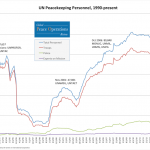 Troop and police presence peaked in 2011 during the Second Ivorian Civil War, and has been declining since. 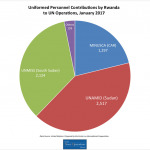 In April 2016, the UN Security Council mandated the mission's final drawdown, citing the country's progress toward peace and stability. 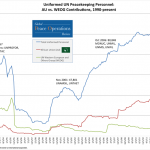 This graph shows the evolution of authorized and actual personnel levels on UNOCI from 2004 to June 2017, the mission's end date. 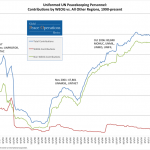 This chart shows the growth in the number of UN uniformed personnel deployed (red line) and authorized to be deployed (blue line) on the United Nations Multidimensional Integrated Stabilization Mission in the Central African Republic (MINUSCA) from its inception in May 2014 to present. 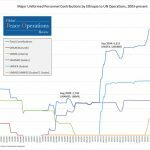 Uniformed personnel include troops, police, and military experts. 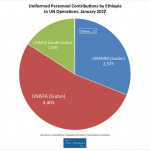 The pie chart on the left shows the number of uniformed personnel contributed to the United Nations Interim Security Force for Abyei (UNISFA) by Ethiopia and by all other contributing countries, with the smaller pie on the right breaking down the five largest contributors besides Ethiopia. 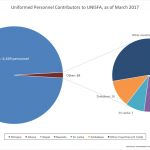 As of March 2017, Ethiopia was contributing 98.1% of all military personnel to UNISFA. 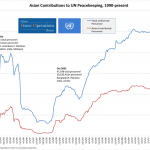 This line chart shows the growth in the number of UN uniformed personnel deployed (red line) and authorized to be deployed (blue line) on the United Nations Interim Security Force for Abyei (UNISFA) from its inception in August 2011 to present. 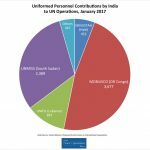 Uniformed personnel include troops, police, and military experts. 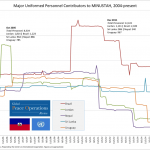 This graphic shows the uniformed personnel contributions of the top five troop contributing countries to MINUSTAH in Haiti, from the mission's inception in 2004 to present. 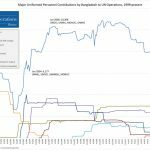 Although MINUSTAH has dozens of countries contributing, these five have consistently sent the most troops and police. 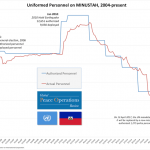 MINUSTAH has been operating in Haiti since June 2004, shortly after the 2004 Haitian coup d'état. 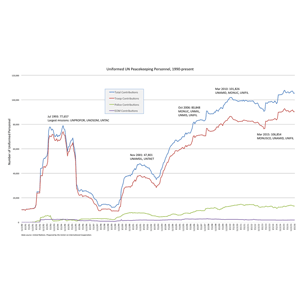 Troop and police presence peaked after the devastating 2010 earthquake, and has been declining since. 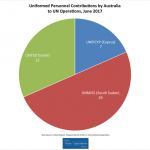 In April 2017, the UN Security Council mandated the mission's final drawdown, with a new peacekeeping operation set to take over in October 2017. 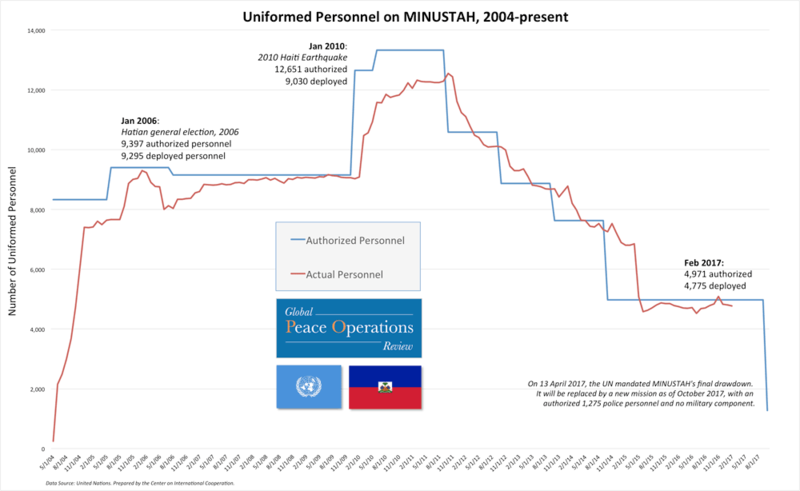 This graph shows the evolution of authorized and actual personnel levels on MINUSTAH from 2004 to present. 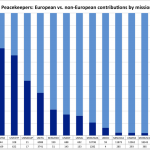 Over the last two decades, European countries have contributed relatively few troops and police to UN peace operations, in comparison to African and Asian states. 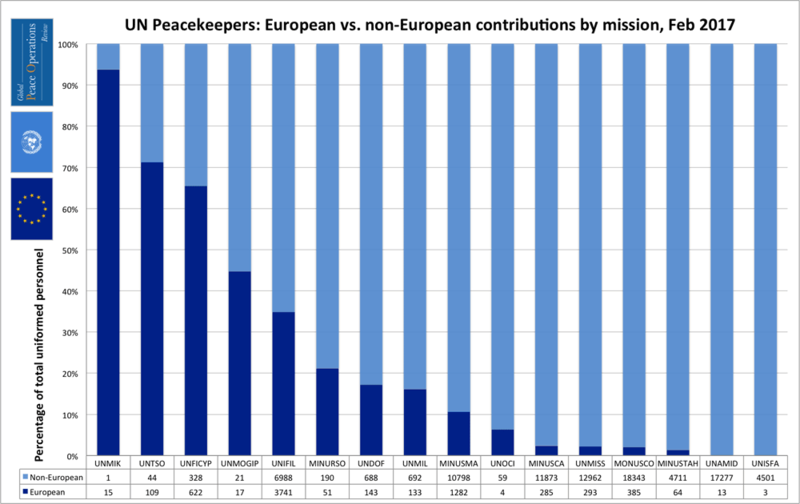 As this chart shows, this trend is still in evidence, with European countries contributing mainly to older missions and missions closer to home, while large missions are mainly staffed by non-European personnel. 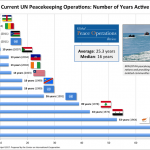 MONUSCO (preceded by MONUC) has been operating in the Democratic Republic of the Congo since September 1999. 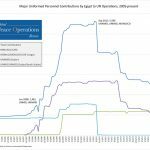 After 17 years of growth, the UN Security Council mandated the mission's first significant drawdown, with several thousand troops scheduled to withdraw in 2017-18. 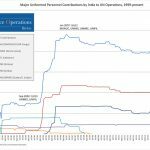 This graph shows the evolution of authorized and actual personnel levels on MONUC/MONUSCO from 1999 to present. 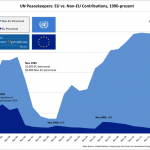 UN peacekeeping missions have mostly been staffed by non-Europeans since 1990. 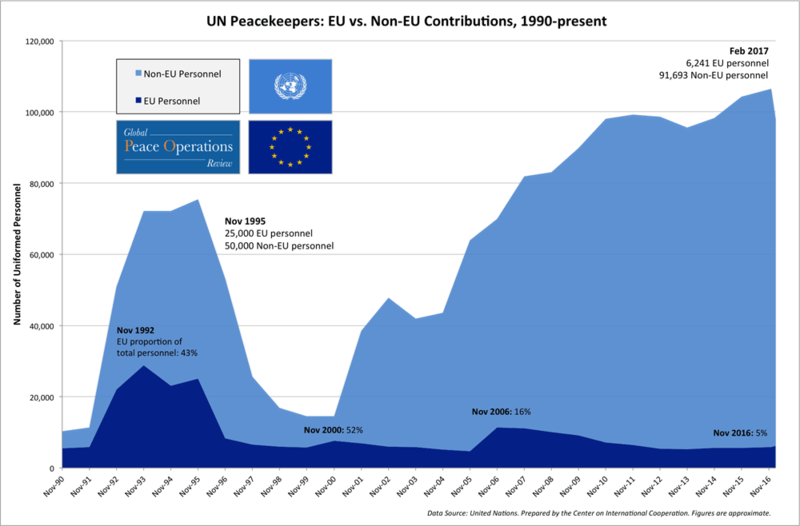 As this chart shows, European uniformed personnel contributions (dark blue) have rarely exceeded 15% of total UN forces since the early 2000s, and hover around 5% of all peacekeeping personnel as of February 2017. 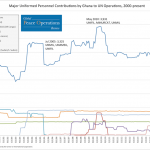 This bar graph shows the 2016-17 annual budgets of current UN peace operations, from smallest to largest, as well as the numbers of personnel deployed / authorized on each mission. 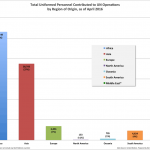 Budgets range from $21 million for UNMOGIP to $1.2 billion for MONUSCO. 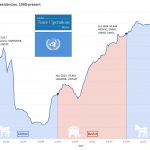 This line chart shows the evolution of uniformed personnel deployed (red line) and the annual budget (blue line) of the the United Nations Mission in Liberia (UNMIL) from its inception to present. 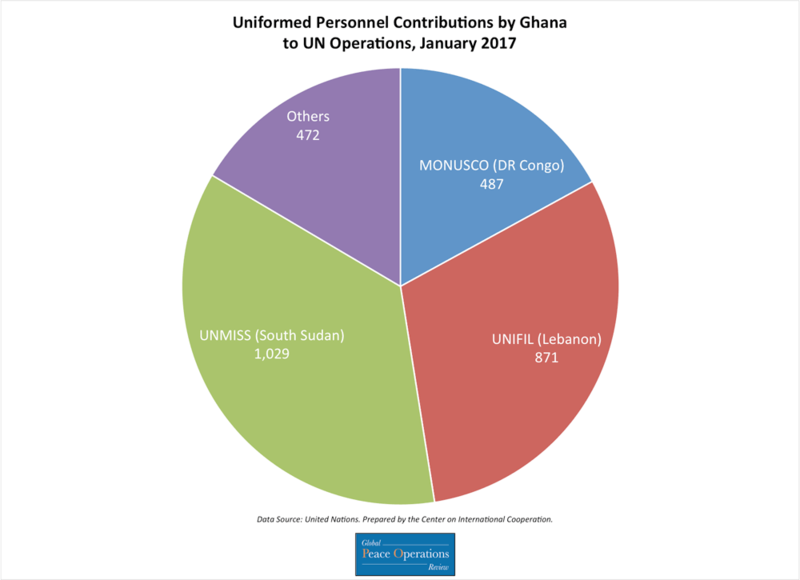 UNMIL has been scheduled to conclude in March 2018, with the final drawdown beginning in February 2017. 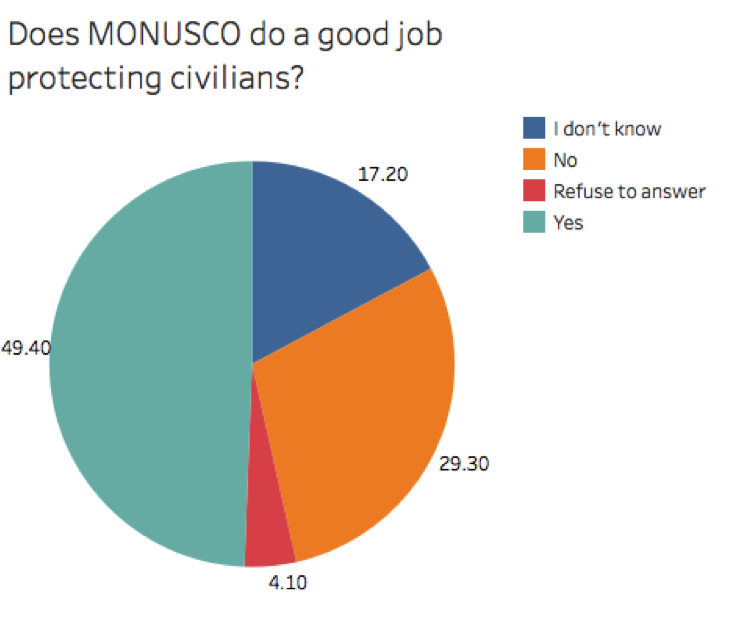 This chart produced for the Congo Research Group, assesses the public opinion of MONUSCO efforts to protect civilians. 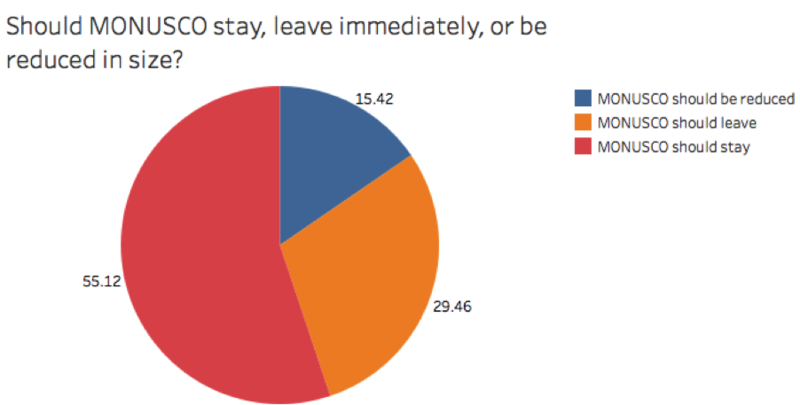 This chart produced for the Congo Research Group, assesses the public opinion of whether or not MONUSCO should stay, leave or be reduced in size. 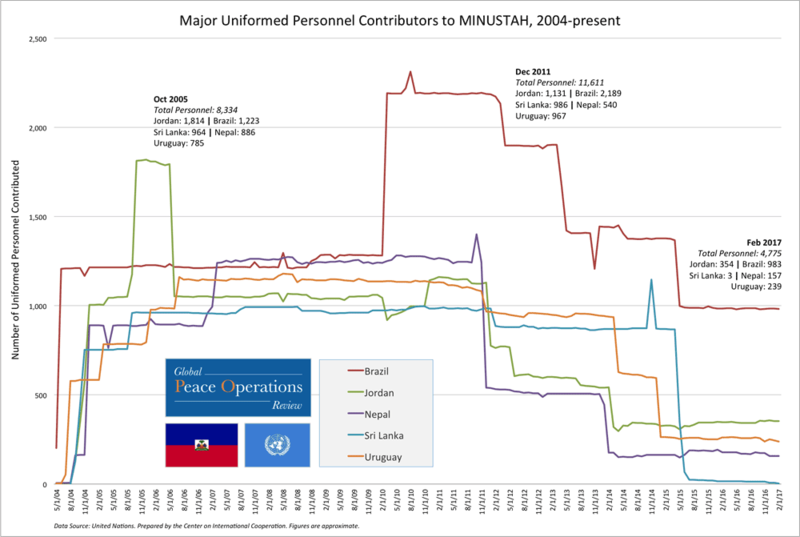 This line chart shows the initial growth and subsequent drawdown of uniformed personnel deployed (red line) and UN-authorized levels of uniformed personnel (blue line) on the the United Nations Mission in Liberia (UNMIL) from its inception (September 2003) to present. 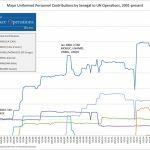 UNMIL has been scheduled to conclude in March 2018, with the final drawdown beginning in February 2017. 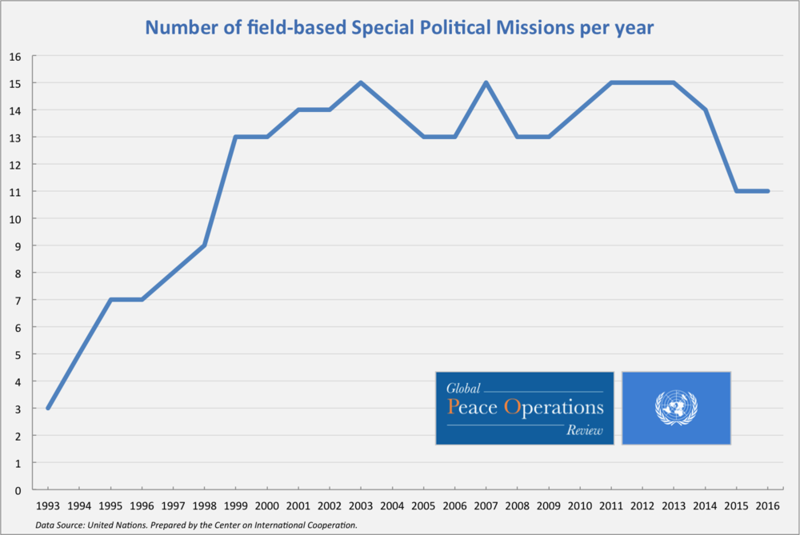 This line chart shows the growth in the number of United Nations field-based Special Political Missions from 1993 to present. 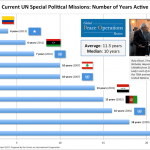 SPMs have been established in Africa, the Middle East, and most recently Colombia, in support of peacebuilding, free and fair elections, and various political and economic reforms. 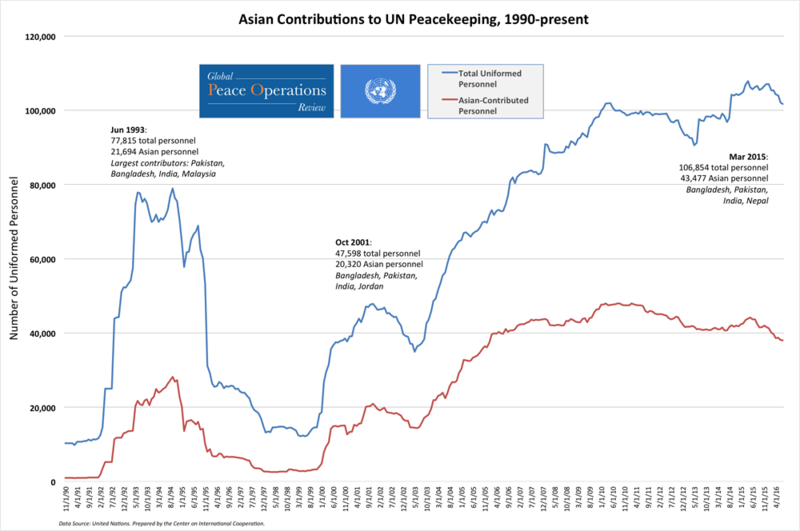 This line chart shows the collective uniformed personnel contributions of Asian countries to UN missions, as well as total uniformed personnel on UN missions since 1990. 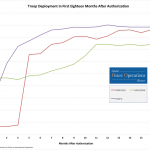 This line chart shows the number of civilians seeking protection from the United Nations Mission in the Republic of South Sudan (UNMISS) on a monthly basis since January 2014. 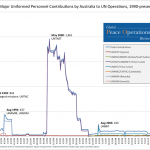 The top line shows the total number of civilians seeking protection, while each line below corresponds to a major state or district where relatively large numbers of civilians are under UNMISS protection. 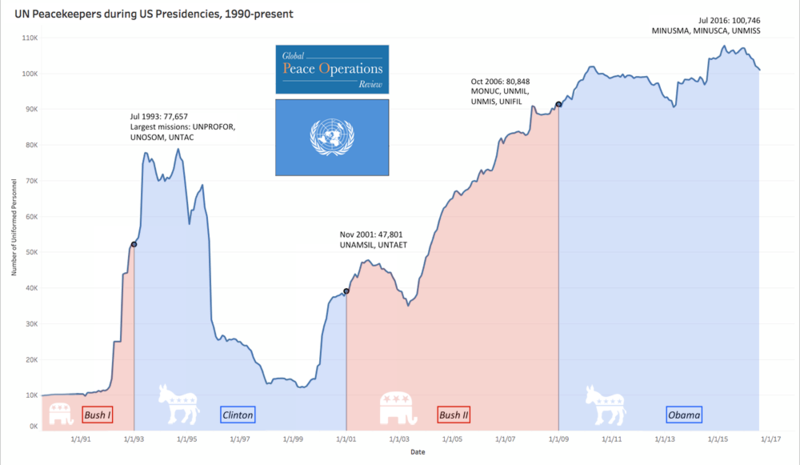 This line chart shows the number of Uniformed Personnel deployments to UN missions in relation to the term and party affiliation of the United States president. This line chart shows the collective contributions of uniformed personnel to UN missions made by members of the African Union (AU), in comparison with those made by UN Western European and Others Group (WEOG) members, as well as total uniformed personnel on UN missions since 1990. 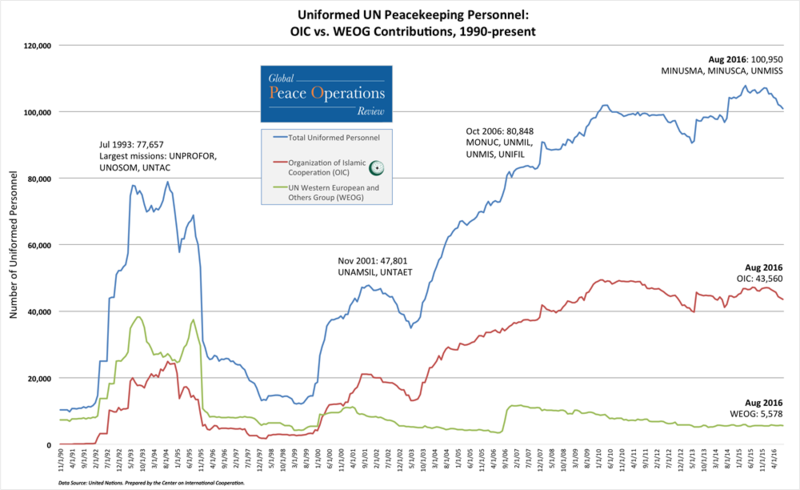 This line chart shows the collective contributions of uniformed personnel to UN missions made by members of the Organization of Islamic Cooperation (OIC), in comparison with those made by UN Western European and Others Group (WEOG) members, as well as total uniformed personnel on UN missions since 1990. 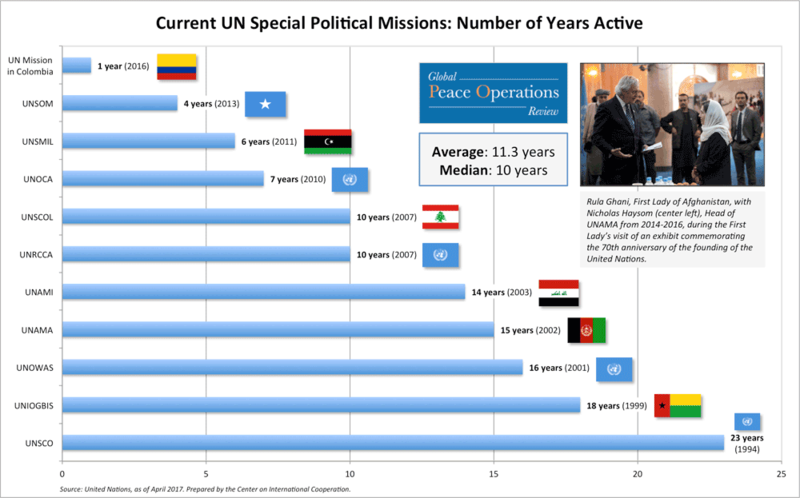 This graph shows the current UN Special Political Missions and their respective years of activity. 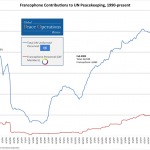 This line chart shows assessed contributions to the annual UN budget by Western European and Others Group (WEOG) members (blue line), and all other UN member states (red line) from 1994-present. 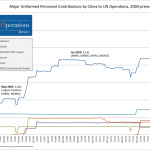 The rapid development of China, among others, has led to an increasing share of the budget being assessed to non-WEOG states in recent years. 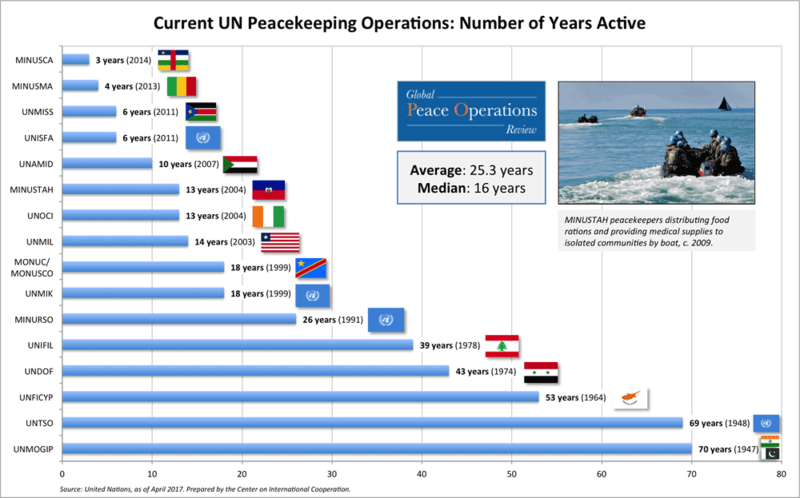 This graph shows the current UN Peacekeeping Operations and their respective years of activity. 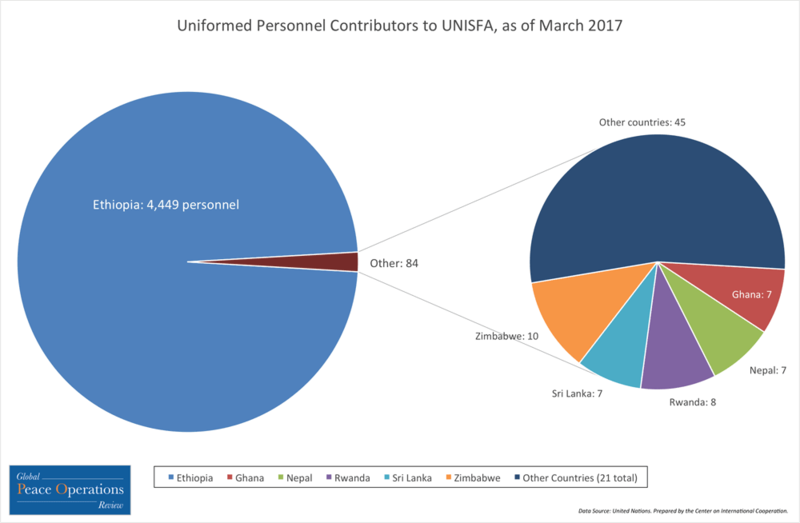 This group of pie charts compares contributions of uniformed UN Peacekeeping personnel by Francophone countries to those of all other Member States. 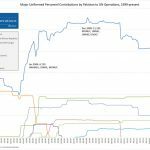 The comparison displays contributions over a twenty-six year period, dating from December 1990 until August 2016. 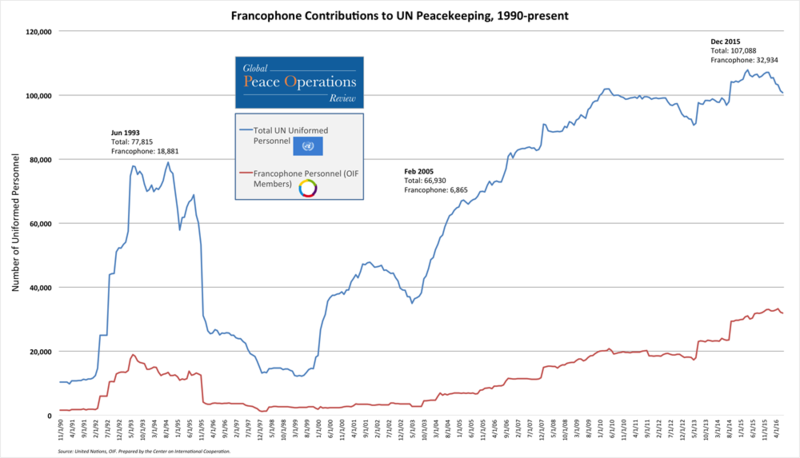 This line chart shows the collective contributions of uniformed personnel to UN missions made by members of the International Organization of La Francophonie (OIF), as well as total uniformed personnel on UN missions since 1990. 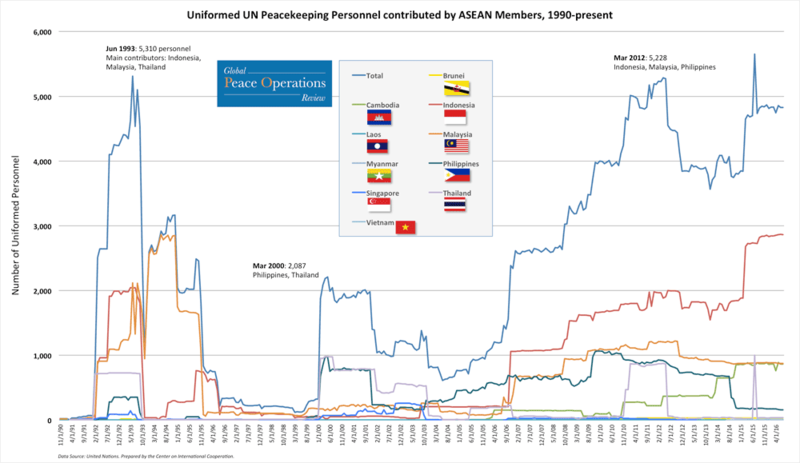 This line chart shows ASEAN member states' total contributions of uniformed personnel to UN missions since 1990. 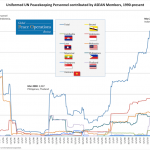 In recent years Indonesia has led the group, with Malaysia, Cambodia, Thailand and the Philippines making large contributions as well. This line chart shows WEOG (Western European and Others Group) total contributions of uniformed personnel to UN missions as compared to all other regions since 1990. 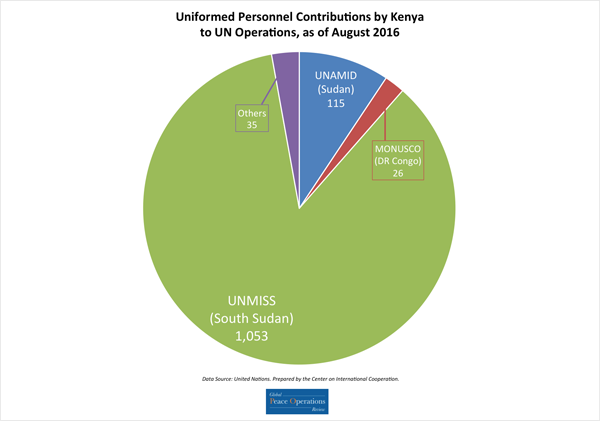 This line chart shows the increase in the number of uniformed personnel deployed (red line) and UN authorized levels of uniformed personnel (blue line) of the United Nations Mission in South Sudan (UNMISS) from its inception (August 2011) to present. 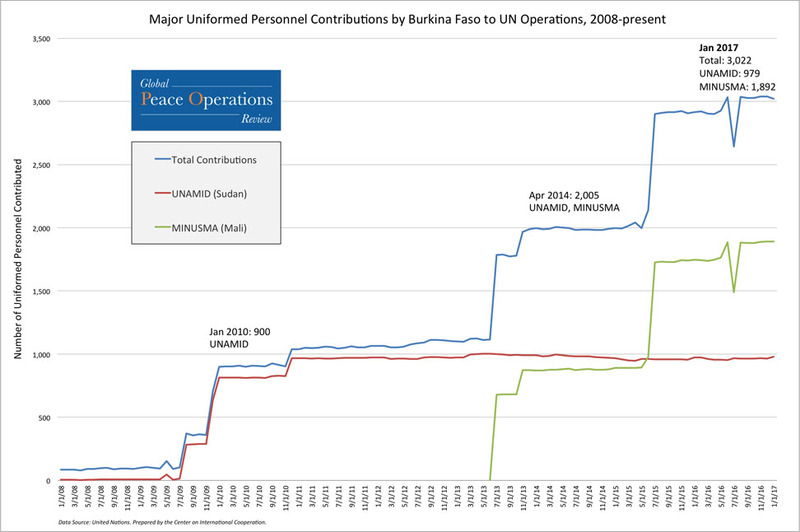 This line chart shows the increase in the number of uniformed personnel deployed (red line) and UN authorized levels of uniformed personnel (blue line) of the United Nations Multidimensional Integrated Stabilization Mission in Mali (MINUSMA) from its inception (July 2013) to present. 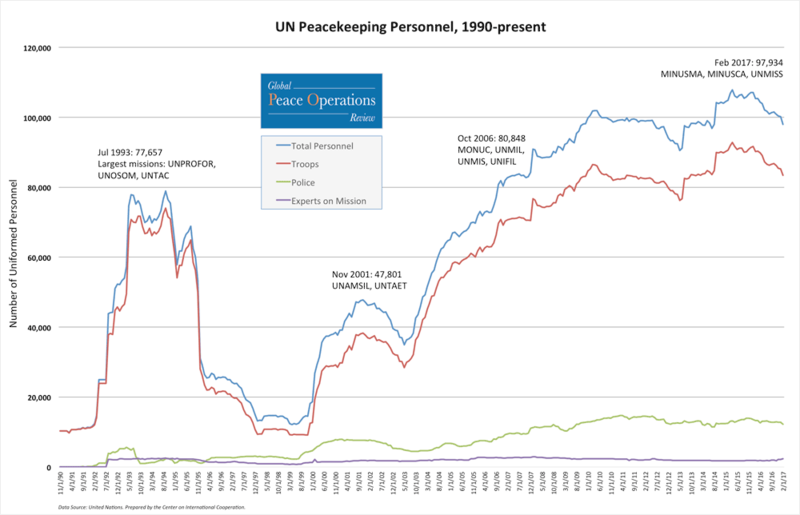 This chart chronicles the growth of UN peacekeeping operations since 1990, showing the evolution of total uniformed personnel as well as each personnel type: troops, police, and military experts. 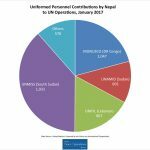 2017 has seen a downtrend as several missions including MINUSTAH, UNMIL and MONUSCO are in drawdown phases. 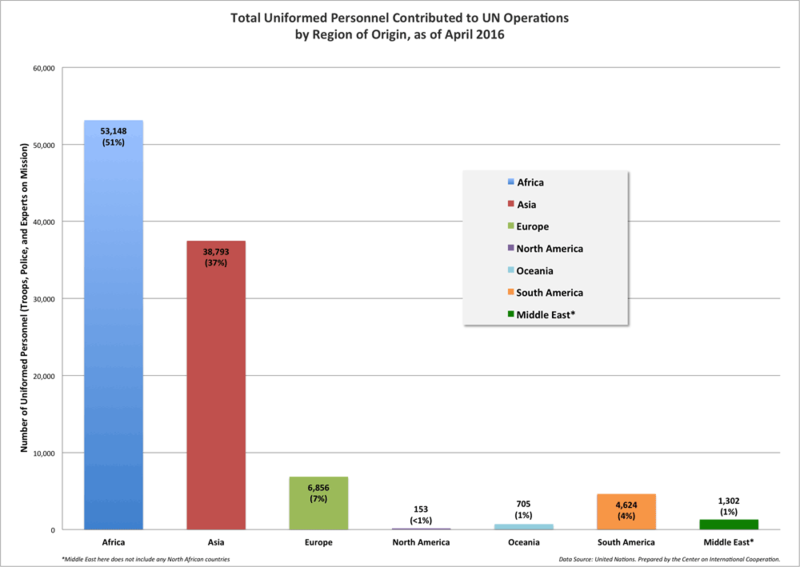 The pie chart on the left shows the proportions and numbers of uniformed personnel contributed to UN operations by Africa and the rest of the world, with the smaller pie on the right breaking down contributions by region and personnel type. 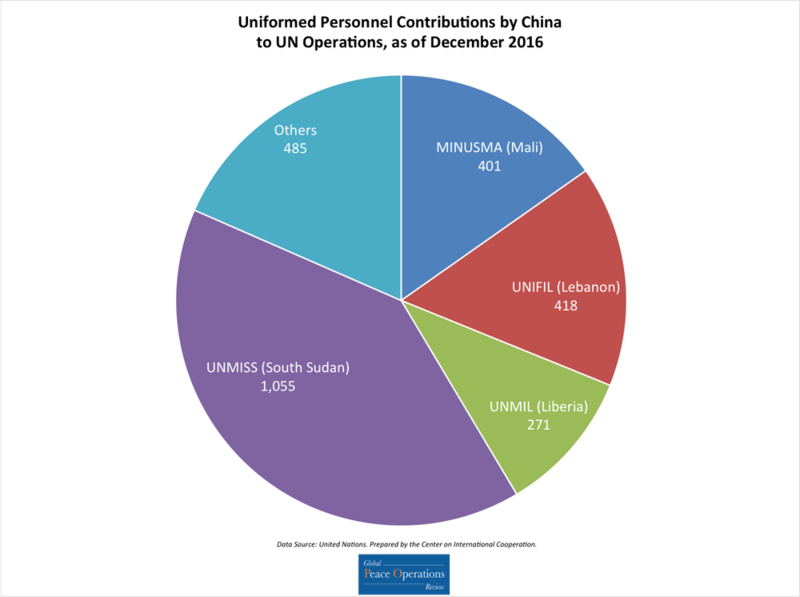 This bar chart shows the proportions and numbers of uniformed personnel contributed to UN operations by region, highlighting the large contributions made by Africa and Asia. 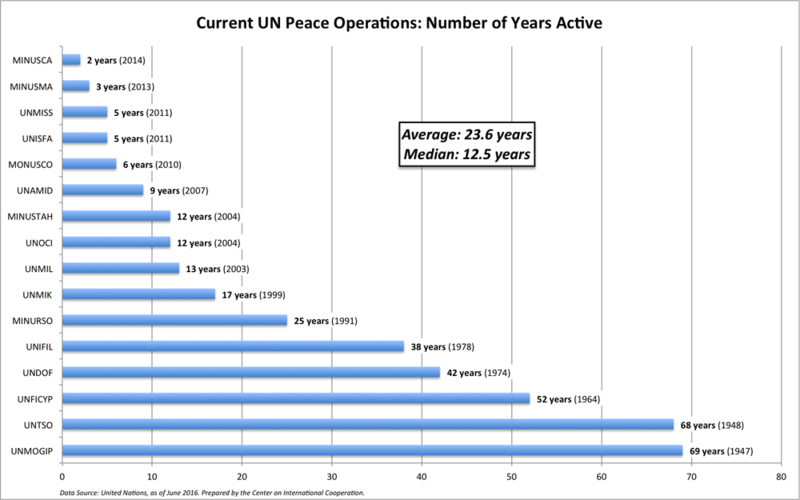 This graph shows the duration of the 16 current UN peace operations, from youngest to oldest, highlighting the diversity of durations and relative recency of several major missions. 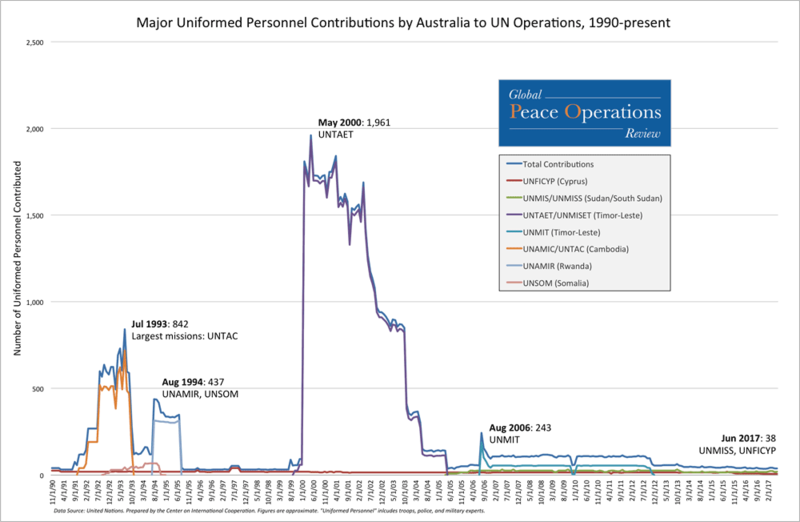 This line graph shows Australia's total contributions of uniformed personnel to UN missions since November 1990 (top line), as well as the ten missions to which Australia made its largest personnel contributions from 1990 to present. 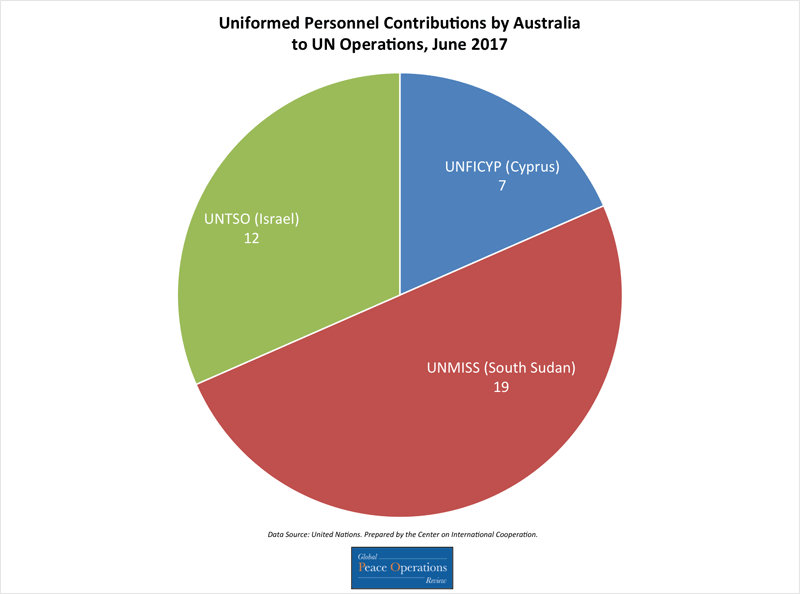 This pie chart shows australia's contributions of uniformed personnel to UN missions, broken down by the number of personnell contributed to each mission as of April 2017. 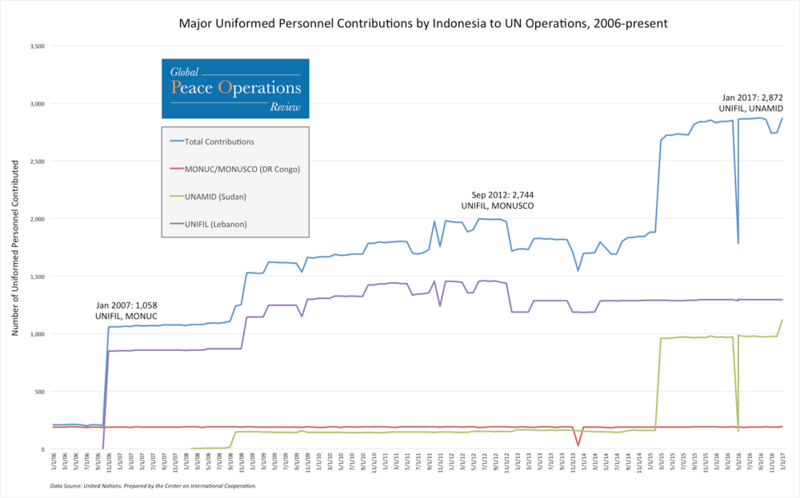 This line chart shows Indonesia's total contributions of uniformed personnel to UN missions since 2006 (top line), as well as the three missions to which Indonesia made its largest personnel contributions from January 2006 to present. 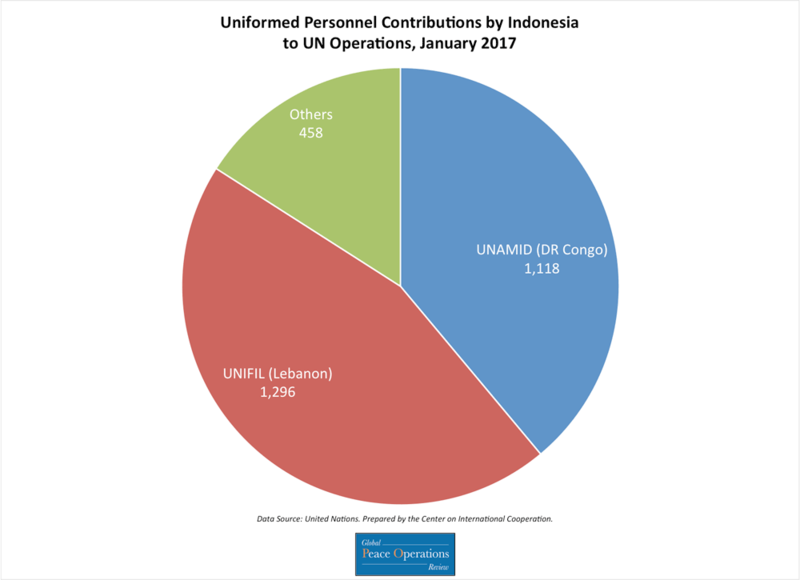 This pie chart shows Indonesia's contributions of uniformed personnel to UN missions broken down by number of personnel contributed to each mission. 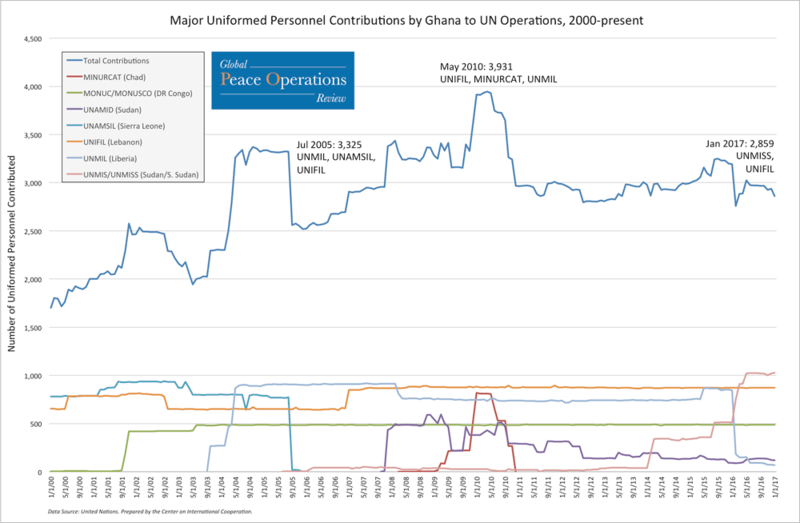 This line chart shows Ghana's total contributions of uniformed personnel to UN missions since 2000 (top line), as well as the seven missions to which Ghana made its largest personnel contributions from January 2000 to present. 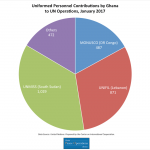 This pie chart shows Ghana's contributions of uniformed personnel to UN missions broken down by number of personnel contributed to each mission. 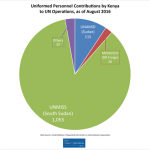 This pie chart shows Kenya's contributions of uniformed personnel to UN missions broken down by number of personnel contributed to each mission. 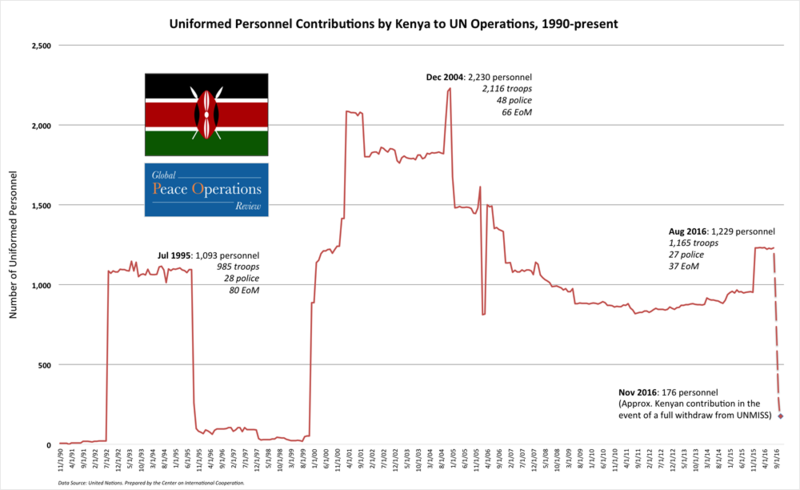 This line chart shows Kenyan contributions of uniformed personnel to UN missions since 1990, with the dotted portion showing the resulting drawdown if Kenya follows through on a proposal to withdraw its personnel from UNMISS in South Sudan. 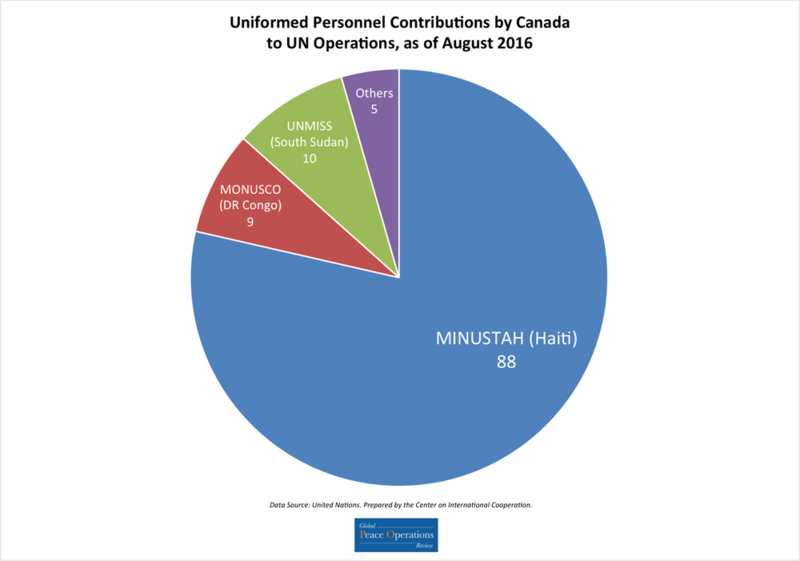 This pie chart shows Canada's contributions of uniformed personnel to UN missions broken down by number of personnel contributed to each mission. This line chart shows Canadian total contributions of uniformed personnel (red line) to UN missions as compared to total UN uniformed personnel (blue) since 1990. 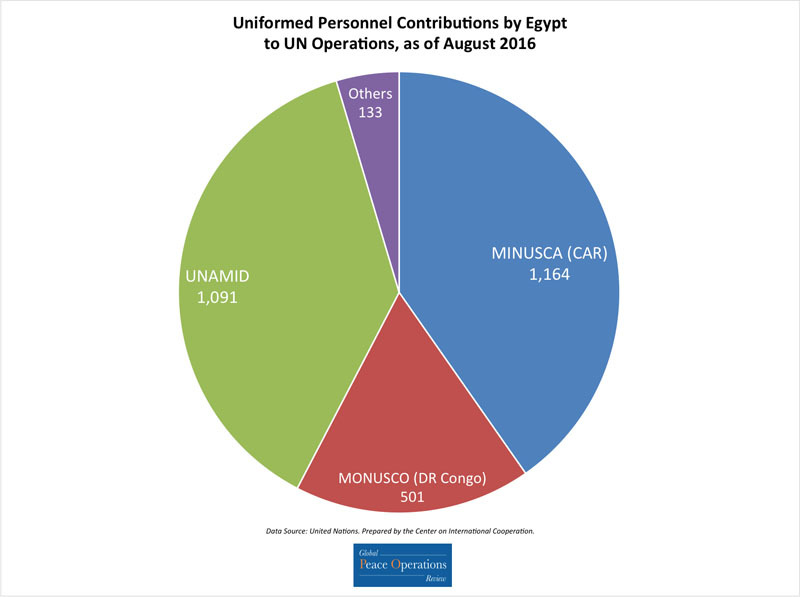 This pie chart shows Egypt's contributions of uniformed personnel to UN missions broken down by number of personnel contributed to each mission. 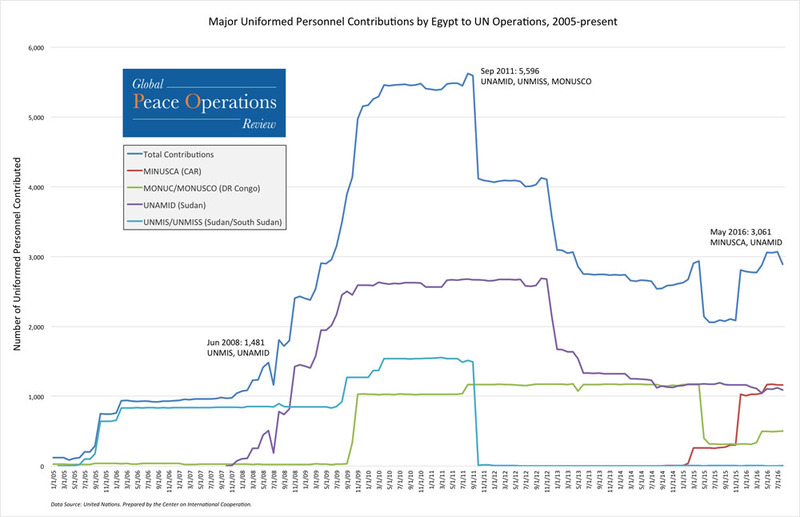 This line chart shows Egypt's total contributions of uniformed personnel to UN missions since 2003 (top line), as well as the five missions to which Egypt made its largest personnel contributions from 2003 to present. 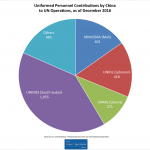 This pie chart shows China's contributions of uniformed personnel to UN missions as of broken down by number of personnel contributed to each mission. 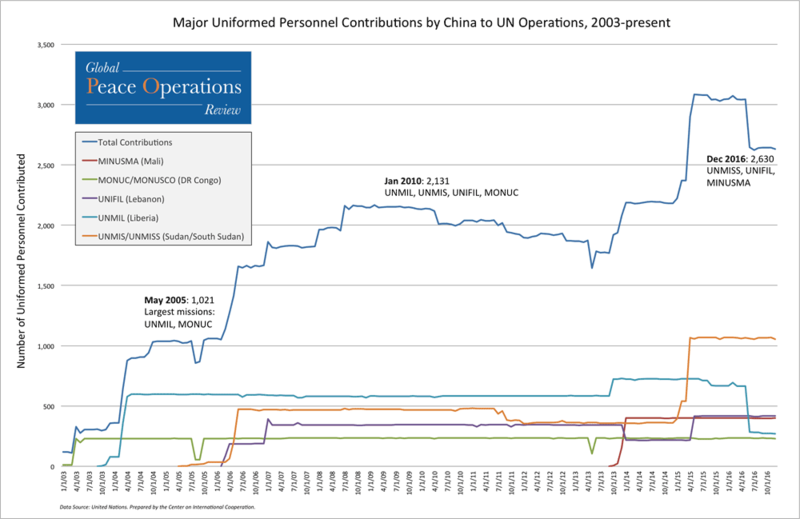 This line chart shows China's total contributions of uniformed personnel to UN missions since 2003 (top line), as well as the five missions to which China made its largest personnel contributions from 2003 to present. 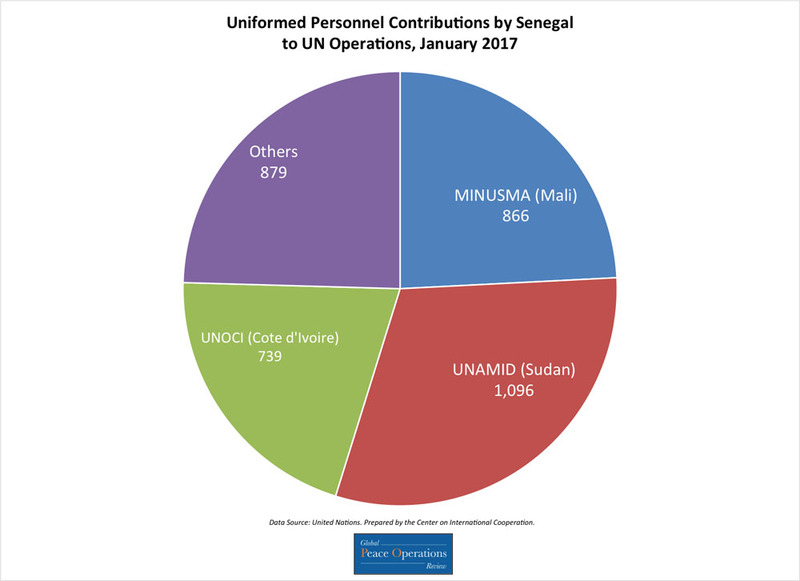 This pie chart shows Senegal's contributions of uniformed personnel to UN missions broken down by number of personnel contributed to each mission. 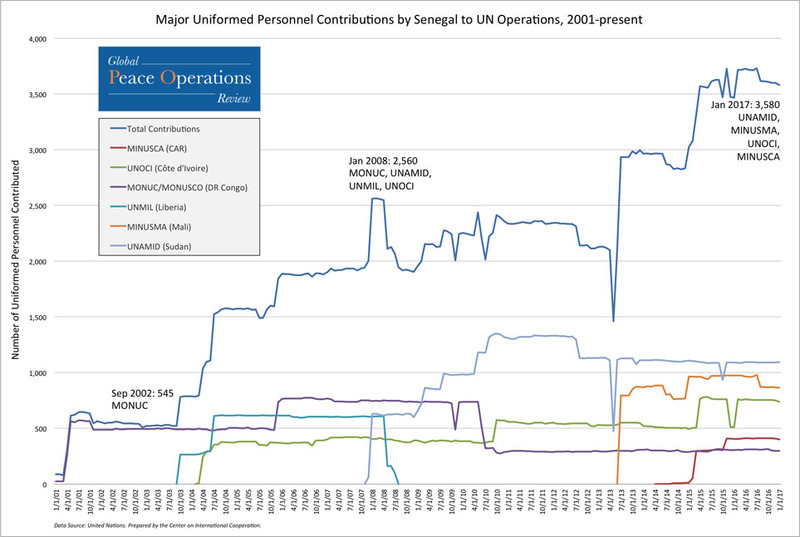 This line chart shows Senegal's total contributions of uniformed personnel to UN missions since 2001 (top line), as well as the six missions to which Senegal made its largest personnel contributions from 2001 to present. 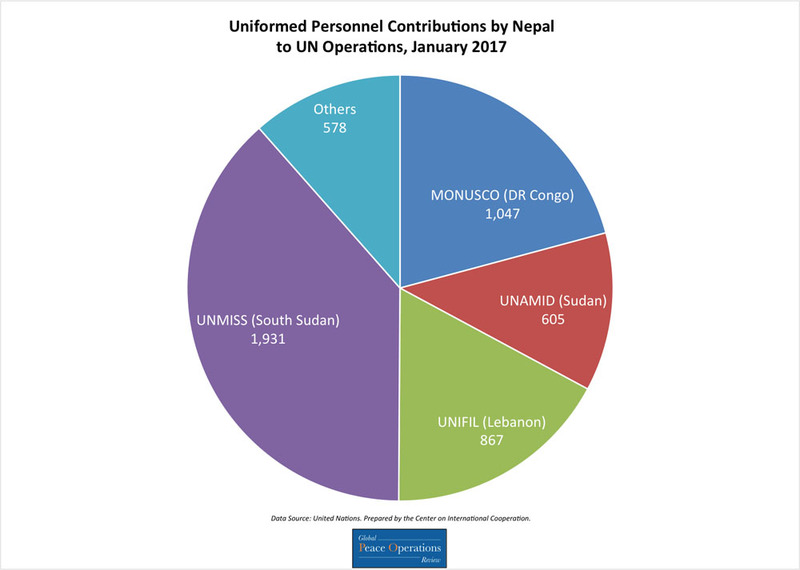 This pie chart shows Nepal's contributions of uniformed personnel to UN missions broken down by number of personnel contributed to each mission. 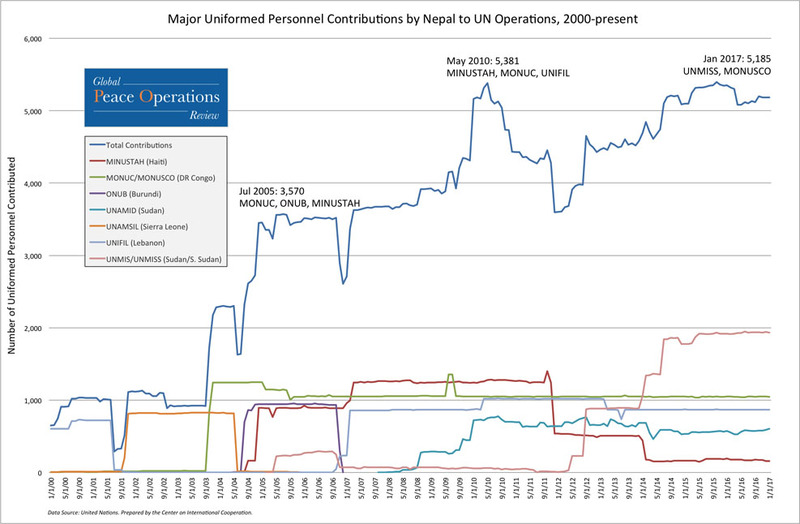 This line chart shows Nepal's total contributions of uniformed personnel to UN missions since 2000 (top line), as well as the seven missions to which Nepal made its largest personnel contributions from 2000 to present. 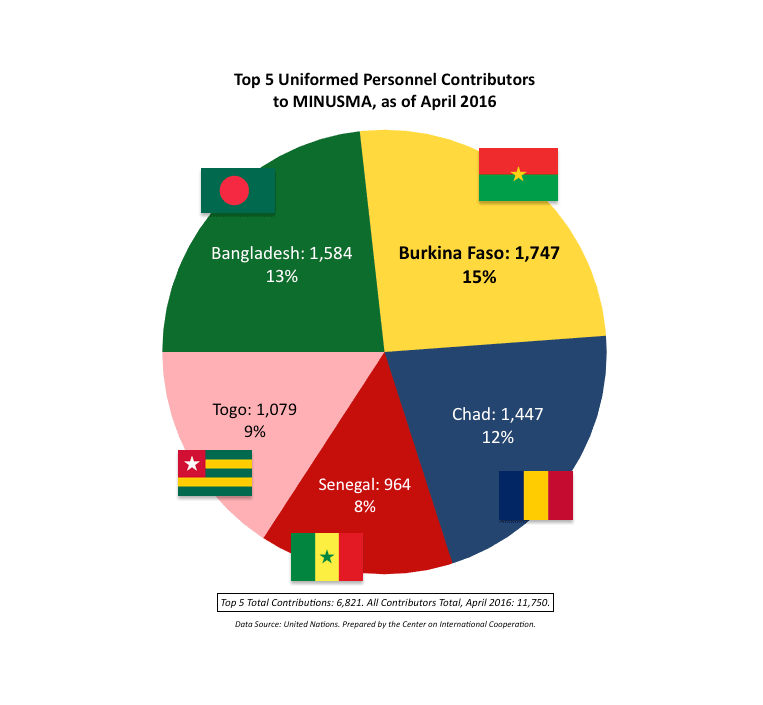 The above chart shows the total contributions of uniformed personnel, to MINUSMA, being made by the top five contributing countries – in absolute terms and as a percentage of total uniformed personnel on MINUSMA. 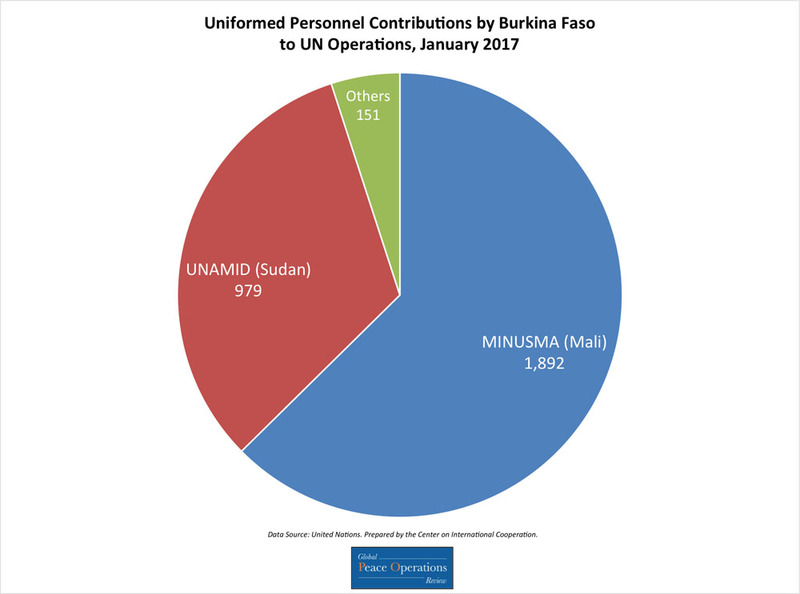 This pie chart shows Burkina Faso's contributions of uniformed personnel to UN missions broken down by number of personnel contributed to each mission. 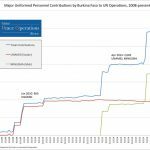 This line chart shows Burkina Faso's total contributions of uniformed personnel to UN missions since 1999 (top line), as well as the seven missions to which Burkina Faso made its largest personnel contributions from 2008 - Present. 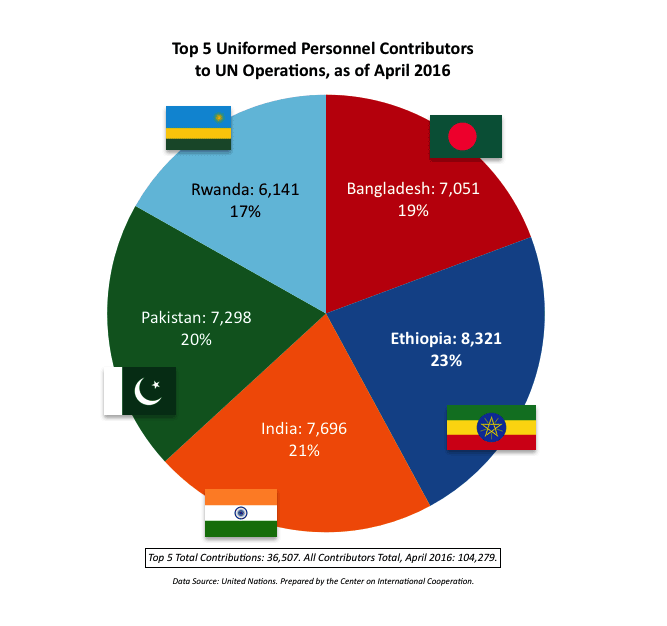 This pie chart shows Rwanda's contributions of uniformed personnel to UN missions broken down by number of personnel contributed to each mission. 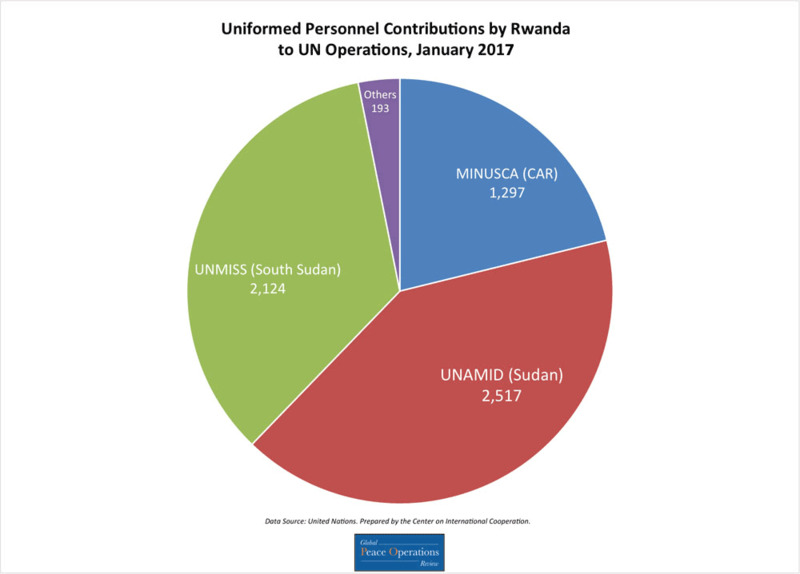 This line chart shows Rwanda's total contributions of uniformed personnel to UN missions since 2005 (top line), as well as the three missions to which Rwanda made its largest personnel contributions from 2005 to present. 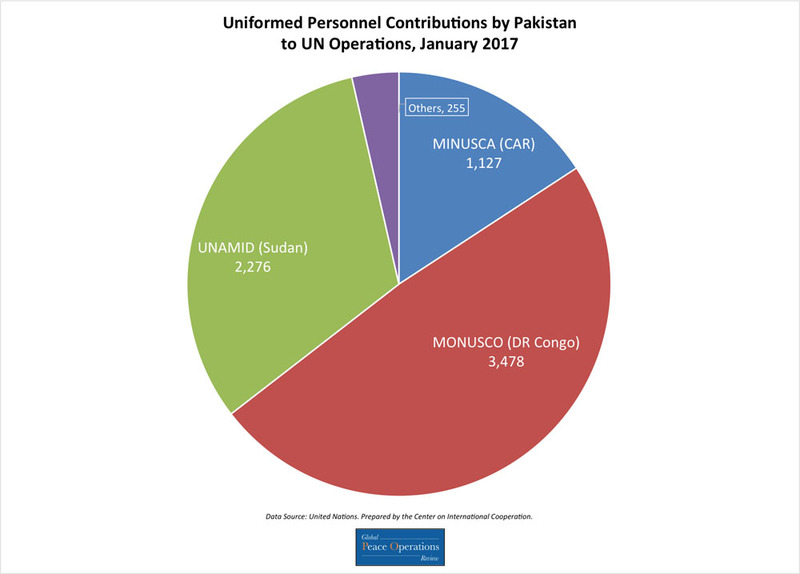 The above chart shows Pakistan's contributions of uniformed personnel to UN missions broken down by number of personnel contributed to each mission. 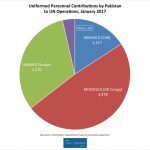 This line chart shows Pakistan's total contributions of uniformed personnel to UN missions since 1999 (top line), as well as the eight missions to which Pakistan made its largest personnel contributions from 1999 to present. 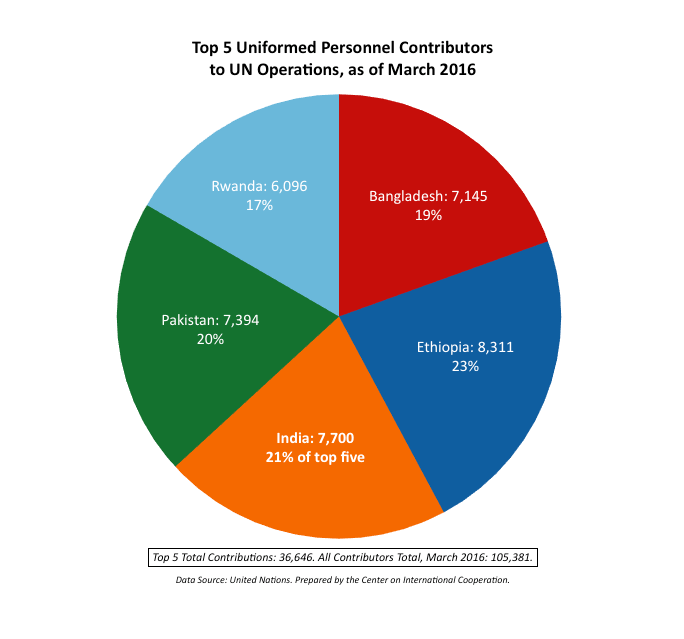 The above chart shows the total contributions of uniformed personnel, to UN missions, being made by the top five contributing countries – in absolute terms and as a percentage of the combined contributions of the top five. This pie chart shows Ethiopia's contributions of uniformed personnel to UN missions broken down by number of personnel contributed to each mission. 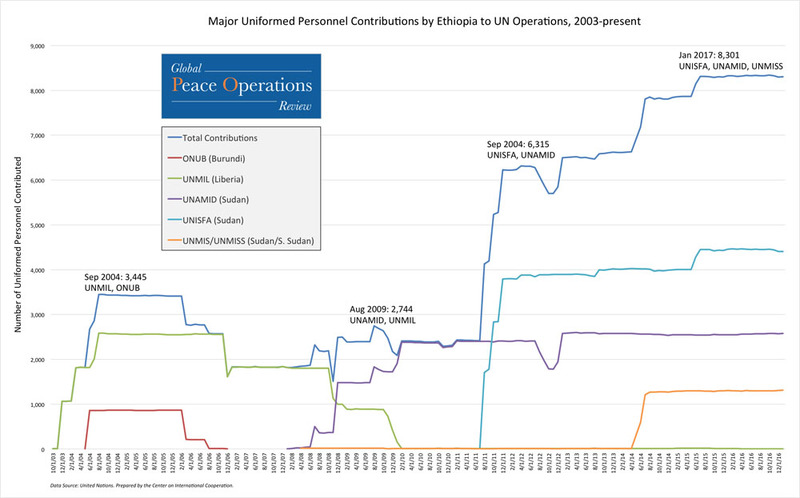 This line chart shows Ethiopia's total contributions of uniformed personnel to UN missions since 2003 (top line), as well as the five missions to which Ethiopia made its largest personnel contributions from October 2003 to present. 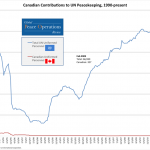 The above chart shows the top five country contributors to UN Peace Operations. The above chart shows Bangladesh's contributions of uniformed personnel to UN missions broken down by number of personnel contributed to each mission. 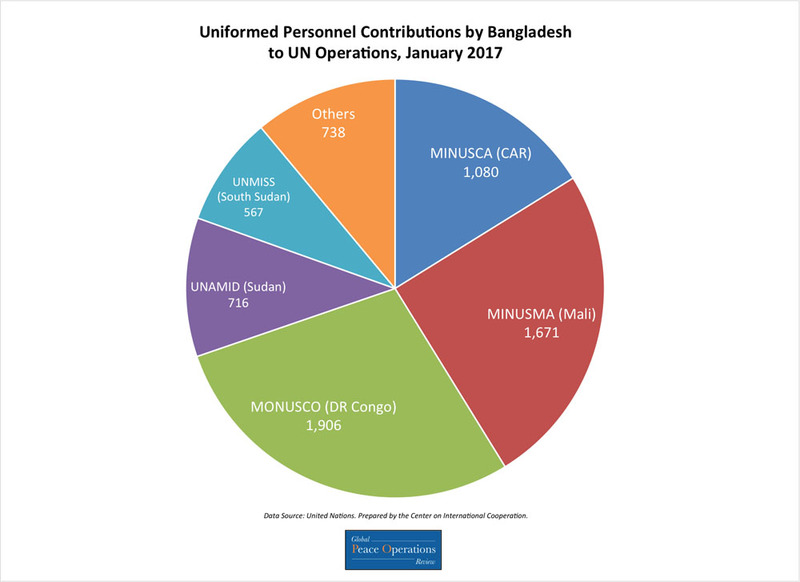 This line chart shows Bangladesh's total contributions of uniformed personnel to UN missions since 1999 (top line), as well as the eight missions to which Bangladesh made its largest personnel contributions from September 1999 to present. 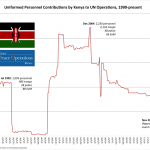 The above chart shows the total contributions of uniformed personnel, to UN missions, made by the top five contributing countries – in absolute terms and as a percentage of the combined contributions of the top five. 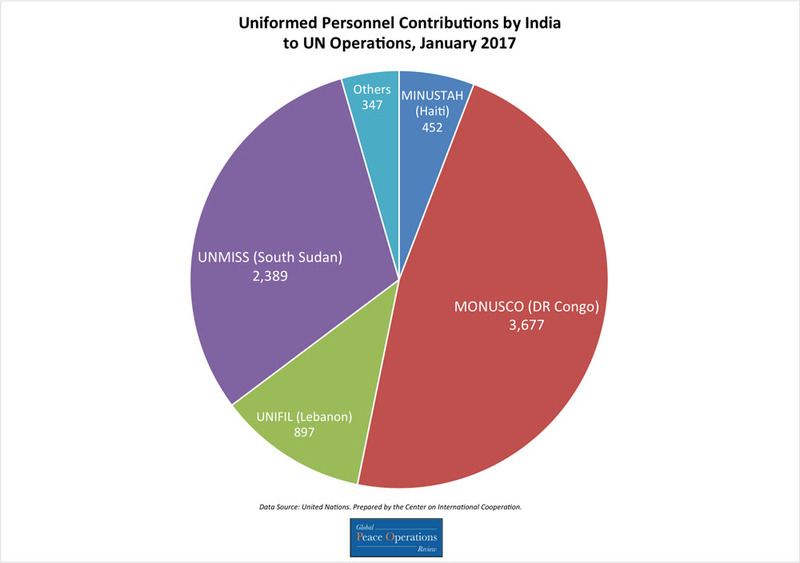 The above chart shows India's contributions of uniformed personnel to UN missions broken down by number of personnel contributed to each mission. 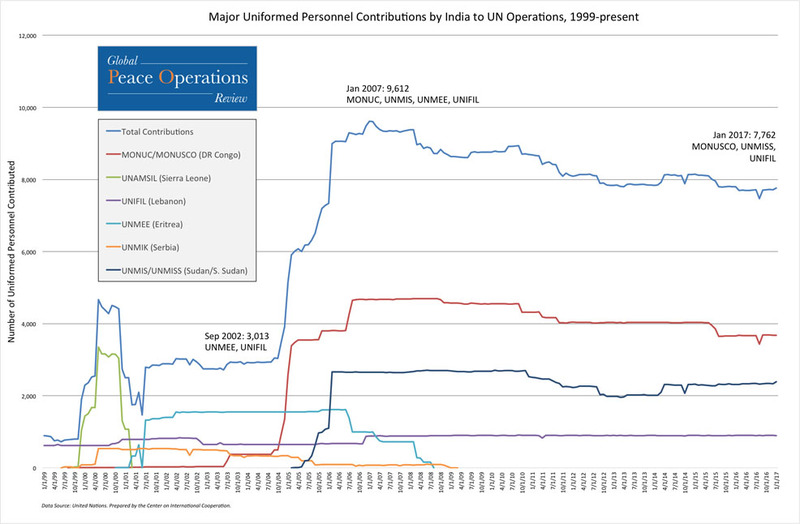 This line chart shows India’s total contributions of uniformed personnel to UN missions since 1999 (top line), as well as the six missions to which India made its largest personnel contributions from January 1999 through present.